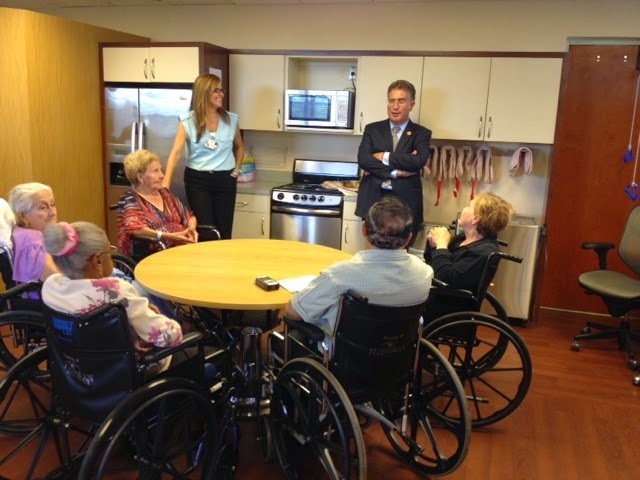 Congressman Joe Garcia today visited the Floridean Nursing Home, Miami’s oldest, family-owned and operated skilled nursing center that is now celebrating its 70th year. During a tour of the center, Congressman Garcia saw first-hand the high level of care provided to residents and patients, focusing in on those who are receiving rehabilitation therapies that will allow them to transition back to their homes or other community-based living arrangements. Some 60 percent of Floridean’s residents – twice the national average – are able to successfully return to the community after undergoing therapy at the the 90-bed facility, which uses a “Team Rehab” approach to help most patients regain the physical capability to return home. The Congressman was shown how Floridean Nursing Home, a 90-bed facility celebrating its 70th year in operation, uses a “Team Rehab” approach to helping patients regain their physical abilities enough to return home or, for the very aged, to maintain their physical conditioning sufficient to remain actively in their care. During Congressman Garcia’s visit, Rice-Schild described the center’s various primary therapy disciplines, and discussed patient characteristics and federal issues affecting rehabilitation therapy services.